Anopheles barbirostris sensu lato belongs to the Barbirostris subgroup of the subgenus Anopheles that is distributed in Southeast Asia. Different molecular forms have been identified based on the rDNA-ITS2 and mtDNA-COI sequences. Anopheles barbirostris occurs in China. The species status was uncertain due to the lack of molecular characterization. The present study characterized Chinese An. barbirostris using rDNA-ITS2 and mtDNA-COI gene sequences. Two cryptic species were identified. DNA was extracted from morphologically identified An. barbirostris specimens collected in Yunnan and Hainan from China, the sequences of rDNA-ITS2 and mtDNA-COI regions of 40 individuals were amplified and analyzed. The sequence comparison revealed two cryptic species, corresponding to An. barbirostris A1/clade III and A2/clade IV, respectively. The molecular characterization updated the species composition of the An. barbirostris complex in China. This study distinguished two molecular forms in the An. barbirostris s. l. in China. Anopheles barbirostris van der Wulp 1884 is a member species of the Barbirostris subgroup of Subgenus Anopheles, Genus Anopheles. Anopheles barbirostris is distributed in oriental regions, such as India, Sri Lanka, Thailand, Myanmar, Cambodia, Vietnam, Malaysia, Indonesia and Nepal . Anopheles barbirostris sensu lato is a species complex, according to the cytogenetic and molecular characteristics and hybridization results -. Variations in habitats, resting behaviour and feeding preferences have been reported in the An. barbirostris s. l. Some of them have been implicated to be responsible for malaria and filariasis transmission in Southeast Asia -. Morphologically, it is difficult to distinguish member species one from another ,,. The sequences of ribosomal DNA second internal transcribed spacer (rDNA-ITS2) and mitochondrial cytochrome DNA oxidase subunit I (mtDNA-COI) exhibit a low level of intraspecific variation and a high level of divergence between species. It is this feature that renders the genes useful as molecular characters for taxonomic classification and phylogenetic inference -. In the case of An. barbirostris complex, molecular analyses of rDNA-ITS2 and mtDNA-COI gene revealed different molecular forms. For example, Saeung et al. defined A1, A2, A3, A4, and An. campestris-, and Paredes-Esquivel et al. identified five clades I, II, III, IV and V ,. In China, An. barbirostris s. l. was recorded in provinces of Guangdong, Hainan, Yunnan, Zhejiang, Anhui, Guangxi, Sichuan and Guizhou, but it has not been implicated as a vector for human pathogens . The species status was uncertain due to the lack of molecular characterization. In this study, the rDNA-ITS2 and mtDNA-COI sequences were analyzed for the specimens of An. barbirostris s. l. from Yunnan and Hainan China. Two cryptic species were identified. Wild mosquito adults were captured and sampled from Yunnan and Hainan in China and Myanmar. Detailed information on collection sites is presented in Table 1. The adults were captured using tubes or light traps in livestock rooms. The species of An. barbirostris s. l. were identified using morphological keys . The specimens were kept individually in tubes with silica gel and stored at −20°C until DNA extraction was performed. The genomic DNA was extracted from individual adults using the Insect Tissue DNA Extraction Kit (Aidlab, China). The rDNA-ITS2 and mtDNA-COI fragments were amplified by PCR. Each PCR (50 μL total volume) mixture contains 1 × PCR buffer (TOYOBO, Japan), 0.2 mM of each dNTP, 1 unit of KOD FX (TOYOBO, Japan), 0.1 μM each of the forward and reverse primers and ~50 ng genomic DNA. The ITS2 region was amplified using primers , 5.8S (forward 5′-GAA TGT GAA CTG CAG GAC ACA TG-3′) and 28S (reverse 5′-GGG GTA GTC ACA CAT TAT TTG AGG-3′). The COI gene fragment was amplified by using primers , COIBAF (forward 5′-TTG ATT TTT TGG TCA TCC AGA AGT-3′) and COIBAR (reverse 5′-TAG AGC TTA AAT TCA TTG CAC TAA TC-3′). The thermal profile for PCR was 94°C for 2 min, followed by 35 cycles of 98°C for 10s, 45°C for 30s and 68°C for 1 min 30 s (ITS2) or 45 s (COI). A final extension temperature of 68°C was set for 7 min. The PCR products were purified and sequenced in both directions using aforementioned primers. In addition, internal primers BAR1 (5′-GGT GTC ACA TGG TAG ATT AC-3′) and BAR3 (5′-GCG ATC CGA AGT TGA AAG TCA-3′) were used for ITS2 sequencing. The chromatographs of sequences were inspected manually. The ITS2 and COI sequences of all individuals were aligned by Clustal W , respectively. The sequences were deposited in NCBI, the GenBank accession numbers were given in Table 2. The sequences were compared with the available sequences of various species of An. barbirostris complex in GenBank. A phylogenetic tree was created using MEGA 5.1 . Substitution models were tested before reconstructing ML trees. Variation between sequences were measured by p-distance, implemented by MEGA. A total of 40 individuals were used in this study, which were collected in 2009–2012 from Hainan (9 specimens) and Yunnan (26 specimens). The remaining 5 specimens were collected at Lazan, a county on the Myanmar side of the China-Myanmar border. The Chinese side is Naban, Yunnan. The ITS2 sequences of these specimens were amplified by PCR and sequenced. The length was in the range of 1600 bp to 1760 bp. The sequences were compared to the existing sequences of the members of An. barbirostris complex in GenBank. The sequence comparison revealed two species, An. barbirostris A1/clade III and A2/clade IV. Among 40 specimens, 38 hit to A1 (GenBank accession No. AB331555)/clade III (EU812782) with 99% or 100% identity. The remaining two specimens hit to A2 (AB331551)/clade IV (EU812794) with 99% and 100% identity, therefore classified as A2/clade IV (Table 2). The intraspecific variation (p-distance) of rDNA-ITS2 sequences was below 0.001, and the interspecific variation between An. 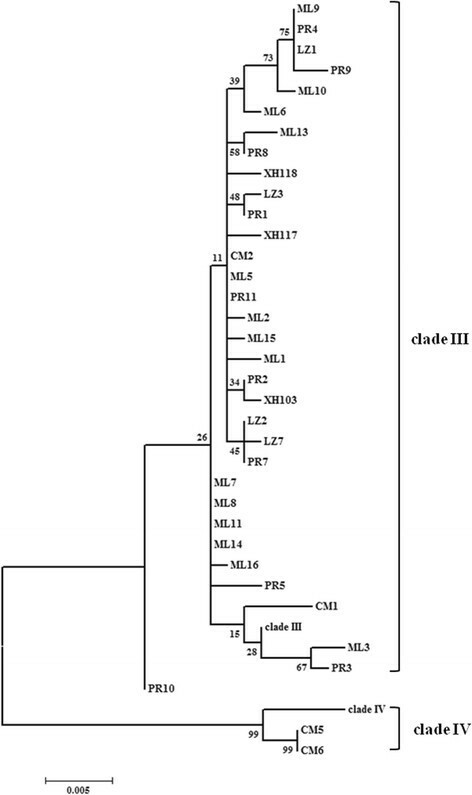 barbirostris A1/clade III with A2/clade IV was above 0.201. The relationships of the specimens were further analyzed by maximum likelihood. Different models were tested for making a ML tree. Figure 1 presented a ML tree that was reconstructed by GTR model. Topology of the tree showed two clades, corresponding to An. barbirostris A1/clade III and A2/clade IV, respectively. This clearly indicates that there are at least two molecular forms in the An. barbirostris complex in China. Maximum likelihood tree created from ITS2 sequences with the GTR substitution model. The referential sequences were A1 (AB331555) and clade III (EU812782), A2 (AB331551) and clade IV (EU812794). The bootstrap values were shown at nodes. A 830 bp fragment of the COI gene was used for the analysis in this study. Out of 40 specimens, 38 sequences were almost identical (99-100% identity) to that of the An. barbirostris clade III (EU797221). The remaining two sequences CM5 and CM6 were the same as the An. barbirostris clade IV (EU797257). The intraspecific variation (p-distance) of mtDNA-COI gene sequences was below 0.012, and interspecific variation between An. barbirostris clade III with IV was greater than 0.031. The ML tree using COI sequences was reconstructed by HKY + I model (Figure 2). The specimens were clustered into two clades, corresponding to the An. barbirostris clade III and clade IV, respectively. This is consistent with the findings of the ITS2 analysis. Maximum likelihood tree created from COI sequences with the HKY + I substitution model. The referential sequences were clade III (EU797221) and clade IV (EU797257). The bootstrap values are shown at nodes. Both ITS2 and COI are distinctive molecular characters in distinguishing cryptic species in the An. barbirostris complex. The sequence comparison identified two molecular forms, A1/clade III and A2/clade IV, in the An. barbirostris specimens collected in Hainan and Yunnan. This was the first record documenting the presence of cryptic species in An. barbirostris s. l. in China. 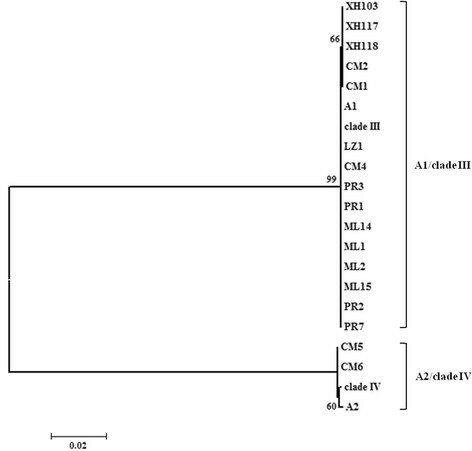 The molecular characterization will be valuable for phylogenetic study of the genus Anopheles in China. The authors thank Jinyong Jiang, Hongning Zhou for providing Yunnan and Myanmar specimens, Linhai Zeng, Wei Zhao for providing Hainan specimens, and Zhenzhou Yang, Xiangyu Li, Hua Shi for mosquito collections. This work was supported by the foundation from the Infective Diseases Prevention and Cure Project of China (No. 2012ZX10004219-010) and National Natural Science Foundation of China-Yunnan Joint Fund (No. U0932604). JX was supported by the grant 1SC1GM109367 from the National Institutes of Health, and the grant DMS-1222592 from National Science Foundation. The funders had no role in study design, data collection and analysis, decision to publish, or preparation of the manuscript. YM designed the study and identified the specimens. YW carried out PCR and sequence comparison. YM, JX and YW performed data analysis and wrote the manuscript. All authors read and approved the final version of the manuscript.